I FINALLY found something for Henry and I do to on the weekend! Henry and I are signed up for baby swim classes at the local aquatic center! The class is called Puddle Ducks (how cute is that?) and it’s at 9:00 on Saturday mornings. They start next weekend, and I couldn’t be more excited for it! We are going to splash and play in the water and just have so so so much fun! And, my mom is going to be in town for our first class, and I’m hoping that I can convince her to come and take pictures of us (I really doubt that I’ll have any trouble with this). ….This was my worst week yet. I did manage to lose weight this week, but only .2 lbs, so I basically stayed the same. I’m really not upset about this, I was actually very surprised that I didn’t gain weight this week. It was Thursday and Friday (mainly Thursday) that caused all the problems for me. 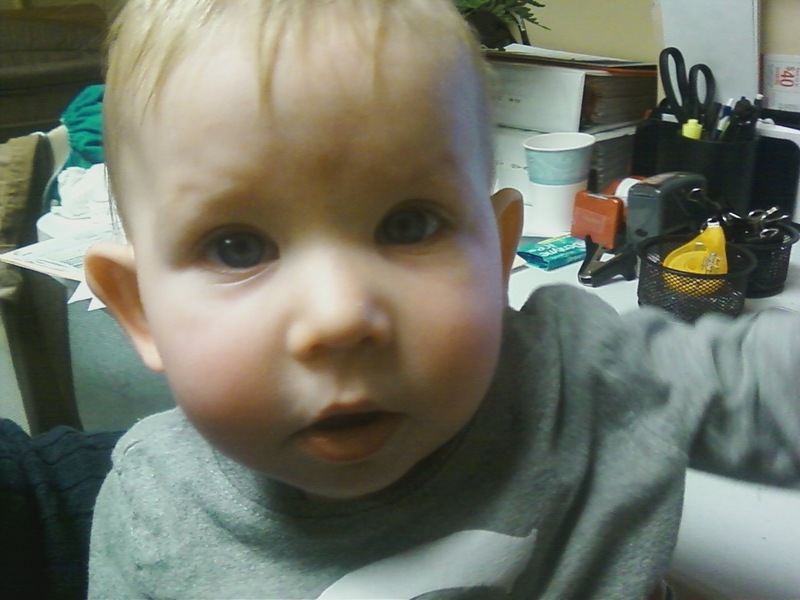 Henry was out of daycare sick on Thursday, and I had to bring him to work with me. Which meant, that my normal healthy eating plans got thrown out of the window. Since I was scrambling to get me and the baby out the door on Thursday (wasn’t able to plan for it the night before, and it takes a whole separate list of things than when he goes to daycare), I wasn’t able to pack anything for me or Henry to eat for lunch or breakfast that day (Henry wasn’t actually up for eating solids anyway). Then, while at work, around 11:30 Henry’s temperature spiked up to 101.2. So, I decided to take him to a minute clinic down the road so they’d look in his ears to make sure they weren’t infected. Well, that turned out to be a waste of time. The minute clinic doesn’t see children under 18 months…and of course I didn’t find this out until after I’d waited for 20 minutes. So, screaming baby in tow, I headed back to work, and it’s at this point in time that I realize I’m starving and haven’t eaten all day. So….I swung by McDonald’s. I needed something I could eat in 30 seconds, and something that I could eat in the car on the way back to work. I knew (and I was right) that Henry would wake up as soon as the care engine turned off, and that he’d refuse to let me put him down after that. So, McDonald’s it was. It was gross, and nasty and I didn’t enjoy it at all – and I don’t think I’m ever going back. When did their burgers become so salty? Anyway, after taking care of a very unhappy and sick baby all day (J was at a clinic type thing and didn’t get home until after 9 that night), I was exhausted and in no mood to cook dinner. So, I decided to order food. And, when we order food we have 3 choices: Pizza, Chinese or Jimmy Johns. I picked Jimmy Johns, thinking it wouldn’t be that bad. I was wrong. Lunch was a total of 36 points +, and dinner was a total of 31 points +. My daily allotment is 33. Then add in all of the drinking that I did over the weekend (3 bottles of wine consumed between me and J over 2 days), and that’s how I managed to only lose 0.2 lbs this week…but hey, I didn’t gain! I did manage to track what I ate everyday this week. A lot of it was going back in after the fact, but that’s better than nothing. Working out this week….yeah, that didn’t happen. With Henry being sick on Thursday and Friday, I didn’t get to work out on either day. And then I was just exhausted on the weekend from taking care of a sick baby for two days by myself. 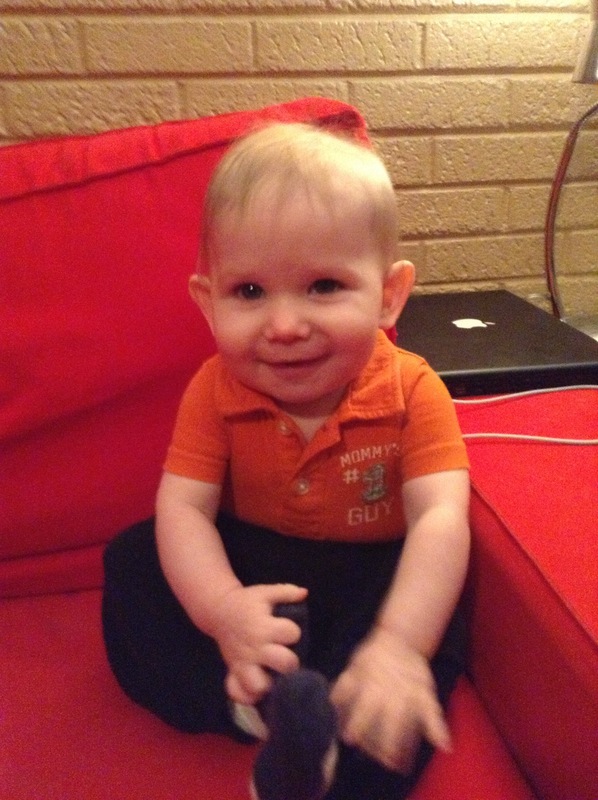 Then on Monday – Wednesday, J was sick, and I was back to taking care of a baby by myself for…well…until today. Part of this was beyond my control, and other parts of it were me sabotaging myself. I REALLY need to find a way to stay motivated and to keep making healthy choices and tracking, and sticking to my workout routine. I just don’t know how to do that…. 8 Months! 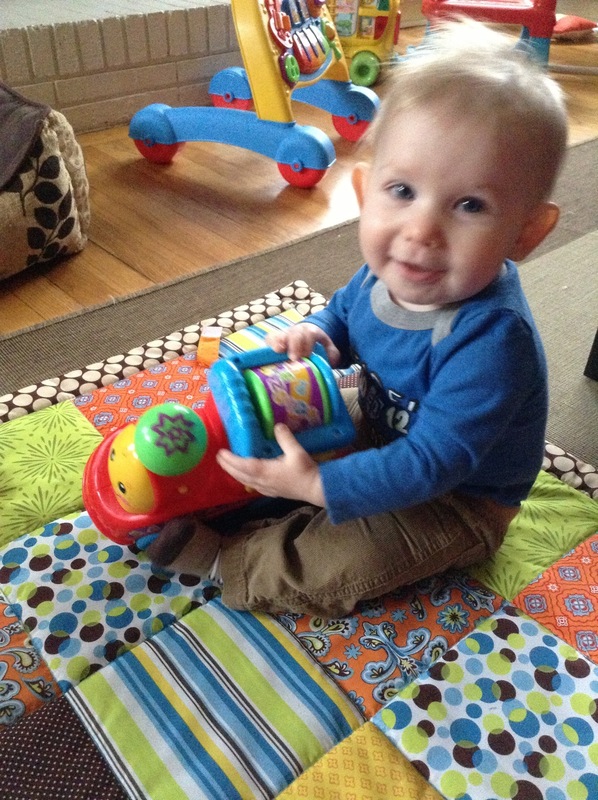 You are 8 months old already! I honestly don’t know how that happened. It really does feel like just last week you were 6 weeks old. I’m honestly astounded at the thought of 8 months. It’s such a short amount of time, and during that time you really have had a monumental impact on my and your dad’s life. There’s not a day that goes by where I’m not thankful for you. I tell your dad almost every night that I love you so so much (I tell you all the time too). You’re getting bigger and bigger and each day you’re less and less my little baby. But, no matter how big you get, you’ll always be my baby. I think that you’ve had a gazillion colds this month. It really does seem like as soon as you get better, you have another one. You stayed out of daycare on Thursday and Friday because you had a fever. You came to work with me those days, although, admittedly, I should have just stayed home with you. I wasn’t able to get much work done because you were just so miserable. You wanted to be held and cuddled, and I was more than happy to indulge you. You are gearing up to crawl. While at work with me on Friday, you were on the floor playing with your toys and I saw you lunge after a toy that was just out of reach. But, instead of landing on your hands and knees, you face planted and then started crying. 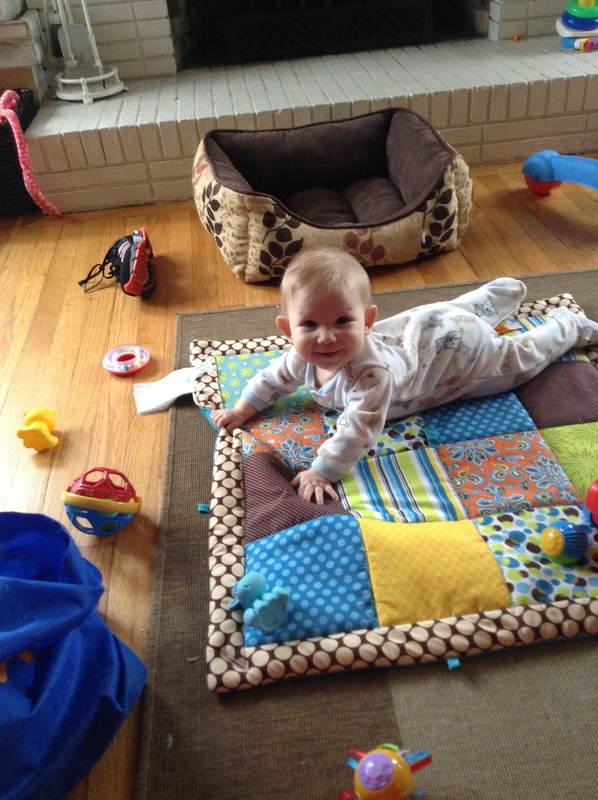 You can push yourself backwards and twist and turn yourself around on the floor, but there hasn’t been any actual crawling yet. But, it’s going to be soon. I can’t seem to decide if I’m ready for you to crawl. Not only am I not logistically ready (I feel like I’ll need to sweep and mop the floors on a regular basis when you’re crawling so that you don’t turn into a dust bunny), but I’m not emotionally ready. I really do think that crawling marks the end of babyhood, and I am trying to hang on with all of my might to you still being a baby that needs his mommy for everything. I need to loosen my apron strings, but I am thankful that I wont’ have to cut them for quite some time. You’re teething something fierce right now. You’ve been a drool monster the past few days. You get everything you touch wet and slimy. I think the cold that you had this past week was due to teething, or at least in part. I keep checking your gums for a new tooth, but I haven’t felt anything yet. You’re getting better and better at feeding yourself. Less and less is ending up in your lap and you’re swallowing more and more. One thing you have learned though is to share with your furry brothers and sisters. The cats, specifically Beemer, will come and steal things off of your tray when we aren’t looking. You’ve also started to drop things to Ali. And, a few times I actually caught you sharing with Ali. Where you’ll hold food in your hand, and reach down to let Ali lick it, and then bring it back up to you so you can finish eating it. While that’s not something I would do, you don’t seem to mind. And, you get really mad when I take food away from you when you’re not finished. I did that with a sprig of asparagus the other day that you were having trouble with, and oh boy did you get mad at me. See all of the tomatoes left on the tray? 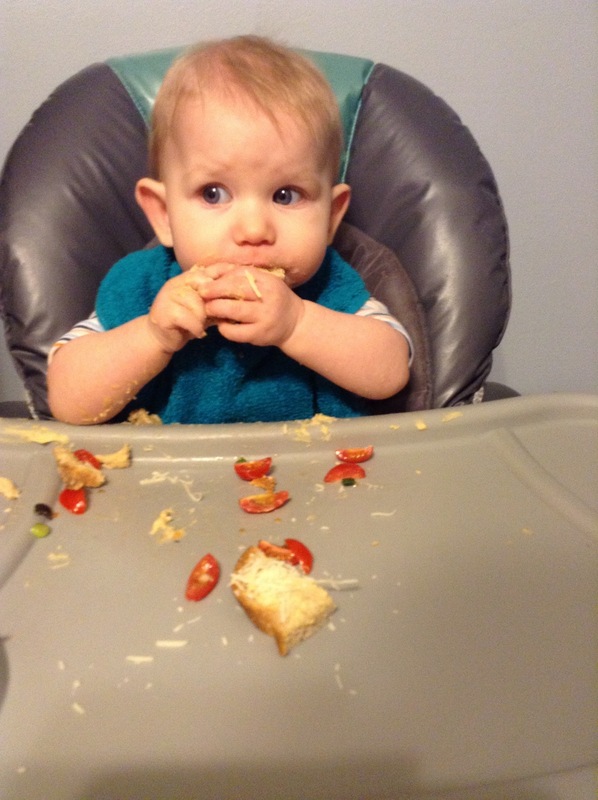 We’re still doing the baby led weaning and you love it. You’re really liking apples and pears, and it’s amazing to me that with only two teeth the amount that you can consume. Things you don’t like: peas and tomatoes. That’s it. You’ll eat tomato sauce, but not an actual chunk of tomato. One thing that does amaze us is that you LOVE vegetables. You’re a fan of asparagus, zucchini, squash, carrots, bell peppers, corn, potatoes, onion, green beans – you name it, you’ll eat it. You and I are still doing great with nursing. You’ll have 3 to 4 bottles at daycare, but we still nurse every morning and evening, and then the whole time on the weekend as well. Ever since you’ve started daycare, you’ve been taking longer and longer on your evening nursing sessions. You’ve started to go from anywhere from 45 minutes to over an hour. 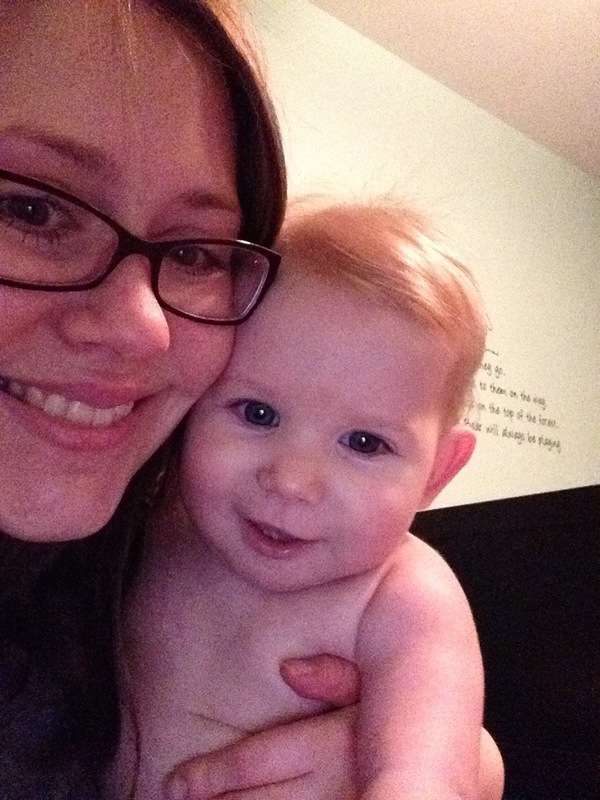 Thursday night when you were sick, you nursed for an hour and twenty minutes. Not all of that is actively nursing, a lot of it is just for comfort. You need your snuggle time with me, and I have to admit that I need that extra snuggle time with you. I love nursing you. I can’t express how happy I am that you and I were/are able to do it. You’re such a sweet baby. You’re just so HAPPY, all of the time. You love to cuddle and snuggle. One surefire way to make you smile is to put you on my shoulders and dance around the house with you. You love it! And I dance my way to every mirror in the house so that I can see your face light up. You still love air plane, and to play “where’s Henry?” – our version of peeka boo. You’re learning to clap, and we’re working on giving high fives and fist bumps. You’re so lovable and so much fun. I love you so so much! I have to say that you finally outgrew this onesie. You wore this your first day in the hospital, and all the way up to you being 6 months old. I put it on you the other day (this picture), and while you’re still adorable in it, it’s a lil bit snug now. I need to find a way to stay more motivated throughout the week, and specifically the weekend. Anyone have any ideas on what to do to keep motivated? How do you stay motivated in your weight loss? -Track my food and drink intake every single day, no matter what! -Have at least 2 days during the week to work out that aren’t Zumba related. 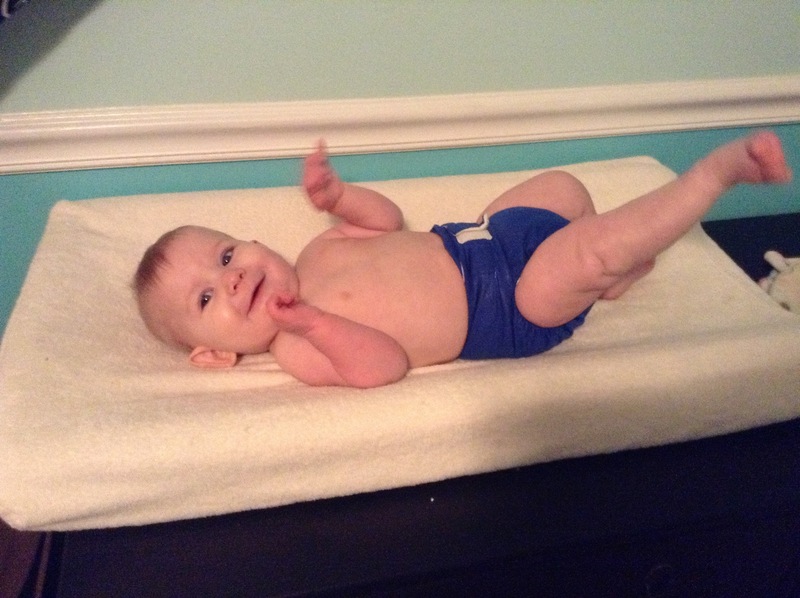 Henry has now been in cloth diapers for 8 months! Softbums: I absouletly love these diapers! They are the most absorbent of all of the diapers that we own. I actually started using the mini pods that we have to add absorbency to our other diapers, and it works great! I love the fact that the leg holes are adjustable. My favorite feature about them is the AI2 system. The fact that the shells are reusable is great. It cuts down on laundry and therefore cuts down on the amount that each diaper is washed so that they last longer. Just last week I bought 2 of the Omni diapers. These are a little thicker than their Eco brothers, but it’s because you can use them as an AI2 and snap in the pods, or use the pods to stuff it like a pocket diaper. I think that’s fantastic because our daycare seems to have problems with cloth diapers, and the simpler we can make it for them, the better, so I love that it gives you options. 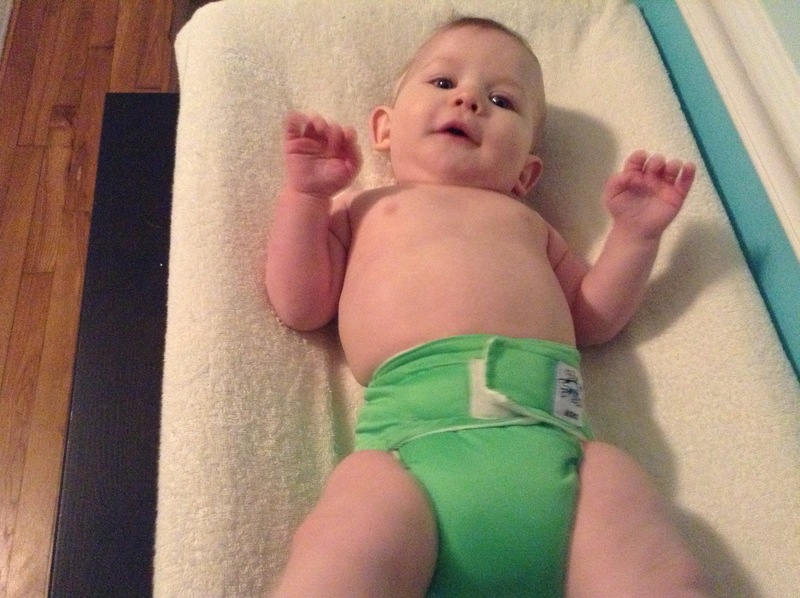 Bumgenius: These diapers are great. They’re affordable and they’ve been holding up great! We have the 4.0 pockets and one All In One. The only issue that we’ve had with them is that the insert has a propensity for staining. The diapers themselves are still white as can be, but after one poop the inserts are stained and have to go out in the sun to be bleached (The Softbums do not have this problem). Bumkins: A while back, Zulily was having a sale on Bumkins pocket diapers. They have such cute designs on them that I bought two and anxiously awaited them to be delivered. I bought one that’s covered in fire trucks, and one that has owls on it (too cute!). Despite how cute these diapers are, they’re pieces of crap. The snaps tore out of the fabric after a couple uses. They leak like crazy. The insert that it came with is not at all absorbent, and it hasn’t been getting better at all over time. J and I now only use these diapers in emergency situations – like when we’re doing laundry and there are no other clean diapers left in the house. DO NOT BUY! These are a waste of money! Blissful Booty: I like this AIO, but J isn’t the biggest fan. We do have to add one of the Softbums mini pods to it to make it absorbent enough for Henry to wear, but with the added pod, he can wear it over night just fine. I like the leg gussets that it has, it helps keep everything contained if you know what I mean. Rumparooz: This pocket diaper is fantastic! The only downside to it, is that they’re expensive! It’s absorbent, they fit great and are very trim. The inserts do stain somewhat, but some time in the sun fixes that right up. This is a great diaper, but may not be the best option for those on a budget. Now that Henry’s on solid foods, his diapers are reflecting that. Whenever he goes number 2, we had to take the diaper and hose it down in the toilet. Those solid poos are not water soluble anymore and would be too much for our washing machine to handle. Having to rinse them out does take a little bit of added time, but not that much, and it isn’t as disgusting as it sounds (technically users of disposables are supposed to do this too – read the label). So, now when we get home from daycare one of us has to take the diapers out of the wet bag and rinse each of them out that needs it. It takes about 3 minutes of time to do it, and really isn’t that big a deal. We have a fuzzibuns diaper sprayer, and it does a really good job (just be careful of water rebounding off of the diaper and onto you/ the wall/ all over the bathroom). For those that are worried about having to install one, J did ours in about 20 minutes, and while I love him dearly, he isn’t the handiest of guys, so if he can do it, anyone can! 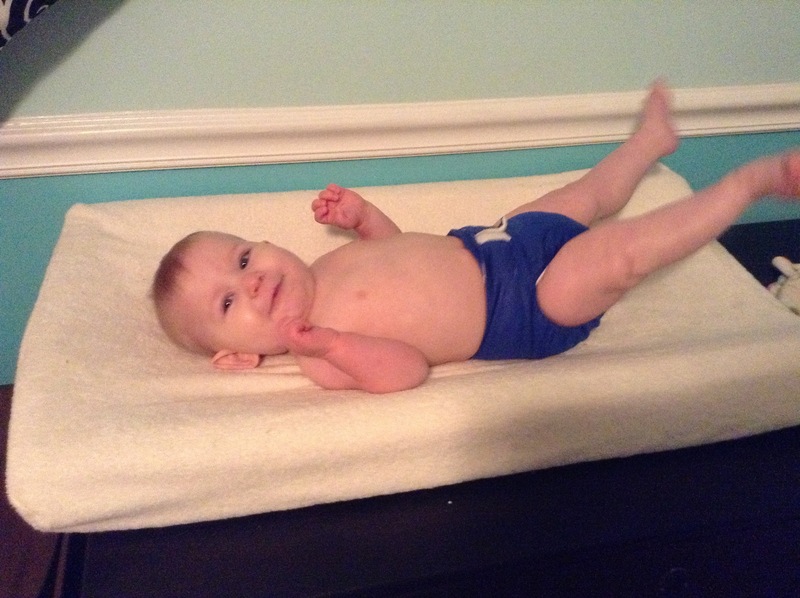 All in all, cloth diapering has been going great. After 8 months we have basically the same stash that we did when we started – and most are just as good as when we bought them. We haven’t had a single case of diaper rash, and slowly but surely our daycare is learning how to put them on the little fella. J and I have had to go over and over and over how to use them, but they’re making progress. Slowly but surely. So, J is going to be out of the house for the next month or so of Saturdays, and I’ve been looking for activities that Henry and I can do together. Specifically with other moms and babies. And, I have to say that it’s not going so well. Most of the Mom/Baby groups that I’ve found all meet in the middle of the week at times where I’m at work and have absolutely no hope of attending. You know, times like 10:30 on a Tuesday. It seems to me that in order to join a Mommy/Baby group you must be a stay-at-home-mom. I did find one Saturday activity with a kindermusik group, but it costs $260 plus a $70 registration fee for 6 months worth or classes, and for something that’s supposed to be fun and easy to do on the weekend (especially where you know you won’t be able to go every weekend) that seems like a lot of money. I’ve “applied” to a few groups on Meet Up, but my application is still pending….It almost feels like I’m rushing a sorority. I’ve looked for Gymboree classes, but according to their website the closest one is an hour away…I’m kinda lost on where to go next to find other moms who want to hang out on the weekend with their babies. 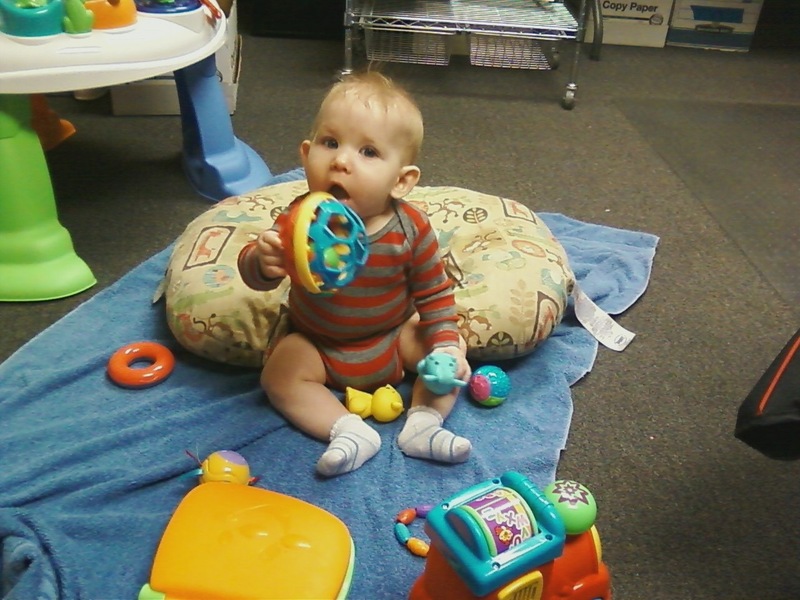 Why is it so hard to meet other moms who have babies around the same age as mine and hang out and let the babies play? Well, I lost 0.8 this week, which isn’t too shabby. I have to say that I’m pretty happy with that. I hit most of my goals for this week, but not all. I tracked everyday except for Saturday…I seriously need to get better about that. I took the dog for a walk around our neighborhood on Sunday, but our plans for a picnic on Saturday got thrown out the window because of the weather, so maybe this weekend we can make that happen. I do need to do better about working out as a whole. I’m really only averaging about 2 nights a week. I need to bump that up to be at least 4. 5 would be better…. J and I are still cooking just about every night, and when we’re not we’re eating leftovers. I honestly can’t remember the last time that we went out to eat…..I think it might have been in December when we met some friends for dinner…. On thing we do need to do better about it not only eating healthy meals, but also quick ones. Meals that can be thrown together in 30 minutes or less (and that includes prep time). In order to eat as a family, we have to start cooking as soon as we walk through the door in the evenings, and it’s hard to get dinner on the table for all 3 of us to eat when dinner takes forever to make. So this week we’ll be on the lookout for some really quick and easy meals.